Cranes in iron and steel plants operate in heavy duty modes (GOST 25546-82), which requires particular attention to following safety standards and equipment strength redundancyfrom the side of the manufacturer. 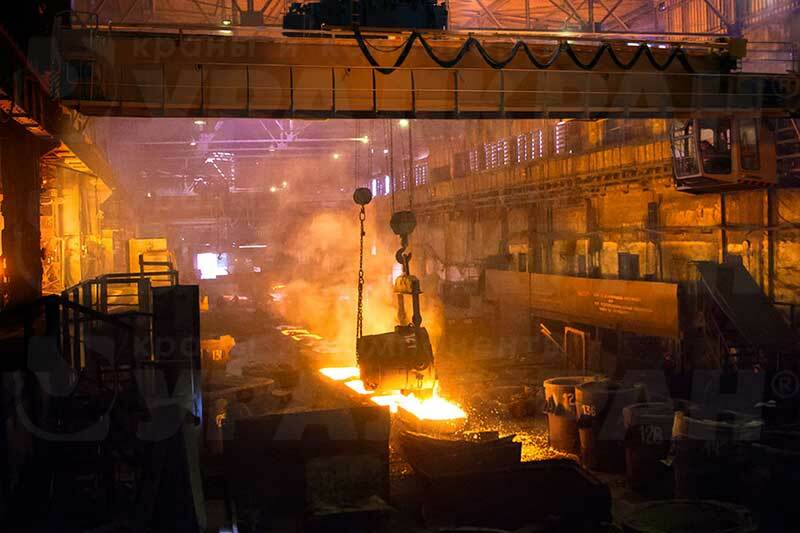 High temperatures, heavy loads, molten metal, necessity to secure key components under the conditions of continuous operation – all of thementioned has to be taken into account in the crane design. Design, manufacturing, delivery, assembly, service and maintenance of all of the types of metallurgical cranes with loading capacity up to 500 tons and lifting range up to 36 m and more under the conditions of uninterrupted production. Procurement of open-hearth plants with casting cranes (mixer, charging, pouring), cranes for open-hearth ingots stripping, ground-type charging machines. Procurement of steel melting shops with modular-transporting, charging and pouring cranes. Procurement of forge & press shops with forge, ingot charging, tempering cranes, forging pedestal-mounted manipulator. Procurement of warehouse spaces, as well as supporting technology processes and shops, with transfer and hook cranes with wire-control, radio-control or from cabin. Design and deployment of the automation, remote control and safety systems. Modernization of equipment currently in place (carrying capacity increase, performance improvement, speed increase, geometrics alteration – arm, span, etc., control complexes replacement with the modern ones). Cranes erection and commissioningon turnkey basis. Integrated scheduled preventive maintenance of load-lifting equipment of any manufacturer and express troubleshooting. Procurement with genuine spare parts throughout the service life. Design documentation takes into account particular conditions of the manufacturing processes of specific facility.